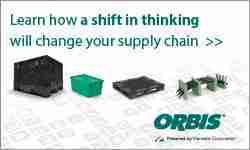 Quarter pallets can deliver added benefits to the last mile of retail distribution. Small or fractional pallets, including quarter and half pallets, can help provide a powerful boost in floor ready retail sales while increasing efficiencies over the “last mile” of retail distribution. Is the quarter pallet the right choice for your POS (point of sale) application? Let’s take a closer look. What is a quarter pallet? A quarter pallet is one with a footprint (length and width dimensions) that is one-quarter of a full sized unit. As such, quarter pallets can vary in size. 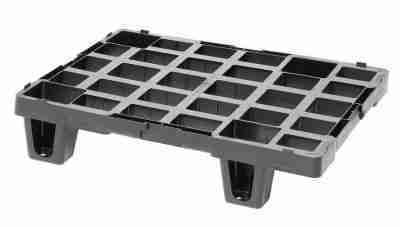 For example, a quarter pallets can be based on a number of full-size pallet footprint dimensions such as 48×40-inch, 48×45-inch, 1200×1000-mm, 800×1200-mm, and others. Quarter pallets are a variety of modular pallet, which can be combined with other like sized pallets to form a full pallet footprint. In what sizes are quarter pallets available? Typical pallet sizes for quarter pallets are 20×24-inch, 24×24-inch, or 600×400-mm, however, there may be a range of sizes customized to specific displayer designs. What are the benefits of a quarter pallet? The key advantage of a quarter pallet is on providing a base for floor ready display at retail while eliminating the need for touch labor to build the display, as well as single case picking at the distribution center. 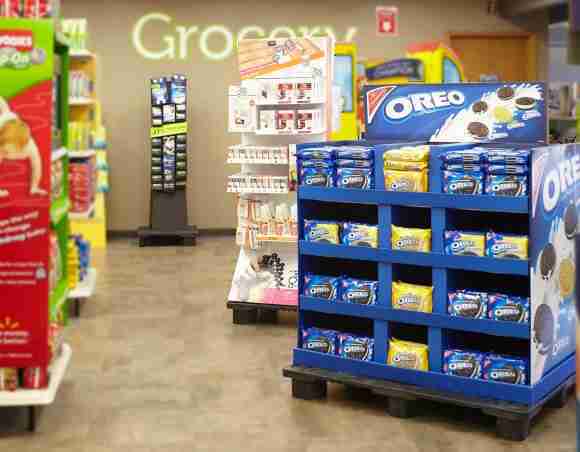 Floor displays at retail have been shown to boost sales, and quarter pallets utilized in conjunction with floor-ready displays help toward that end. Additionally, the use of floor displays can reduce the need for backroom storage at the retail location. 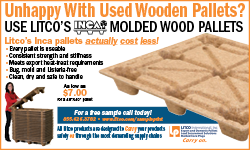 Another little-known benefit of quarter pallets in general shipping applications is in helping to eliminate product damage. Quarter pallets can provide superior product protection to small loads over 100 pounds that would otherwise be shipped unpalletized. From what materials can a quarter pallet be manufactured? Like full-sized pallets, quarter pallets can be produced from a range of materials, such as timber, molded wood, plastic, cardboard, and metal. What features should buyers consider? casters for rolling functionality, eliminating the need for material handling equipment on the retail floor. Quarter pallets present some challenges to consider. For example, the building of quarter pallet displays typically involves increased touch labor and packaging expense versus full pallet building at the manufacturing plant and distribution. 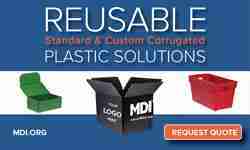 (Some of the extra cost can be mitigated in some cases by postponing the use of secondary packaging, for example, sending bulk containers to the display building location.) Also, distribution activities can also be impacted negatively regarding handling and cube efficiency of outbound freight. Another area of concern can be safe handling. If only one fork tine can fit in the quarter pallet opening, for example, stability can be comprised and may speak to the need of specialized handling options to provide better stability. For a detailed discussion of small pallet handling stability, read this MHI white paper. In terms of disposal, paper pallets are readily recycled, however, pallets of other material not recovered for reuse can be more challenging to keep out of the waste stream, depending upon relationships with recyclers. Where can one find out more about quarter pallets?